Who says the DC Super Friends aren't funny! What are Batman and Robin's favorite part of a joke? The punch line! Girls and boys ages 3 to 7 are sure to love this laugh-out-loud joke book, which features an eye-popping special effect cover and over 100 side-splitting jokes! 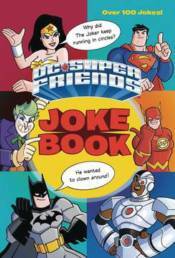 Laugh along with Batman, Superman, Wonder Woman and all of their heroic and hilarious friends! DC Super Friends is a unique brand that gives preschoolers their very own versions of the world's greatest superheroes from DC Comics: Superman, Batman and Robin, Wonder Woman, Aquaman, The Flash, Cyborg, Hawkman, and Green Lantern.